Sarah Hopkins is an Australian author, former criminal lawyer and wife of chef Matt Moran (Masterchef fans will know who that is!) This picture of you is her third novel and it sounds really good! It centres around a family, a couple Maggie and Martin who have been married for 37 years, and their adult son. When the Martin has a car accident one day and then is totally unable to recall why he was even there or what he was doing, Maggie takes it upon herself to find out what happened. Martin meanwhile decides to relive what he can remember, regaling their son with the story of how the couple first met. But all is not as it seems and secrets begin to unravel. “This [is a] searing story of love and betrayal, and a family coming apart at the seams. This Picture of You is urgent, gripping, insightful and intoxicating, an unforgettable journey into the heart of a family and the secrets that threaten to tear it apart” (Amazon US). Author Annamaria Alfieri lives in New York City, but sets her novels in far off locations like South American and Africa. Her latest is set in Nairobi in 1911 during the British East Africa era, and is described as “Out of Africa meets Agatha Christie”. It’s a mystery/romance about well-bred Vera McIntosh, who is very interested in handsome police officer Justin Tolliver. When her uncle is murdered with a tribesman spear the two set about investigating his death. This leads them to the local tribes-people, a vengeful medicine man and a long list of suspects. The is the first in a new series. Emily Gould is a former co-editor of Gawker and blogger and this is her debut novel. It’s about two friends, Bev and Amy, who are two 20-something millenials living in New York City, approaching their 30s and starting to re-evaluate their lives. When their good luck starts to change the two are forced to look at their lives, choices and relationship. Booklist calls it a “savvy first novel that, in piercing prose, zeroes in on modern ennui and the catalysts that force even the most apathetic out of their complacency”. (It has also been recommended by fashion-blogging star Garance Dore on her summer reading list). The 2014 IMPAC Dublin Award, the international prize for fiction, has been awarded to Columbian writer, Juan Gabriel Vasquez for his novel titled The Sound of Things Falling, a literary thriller. English author Mary Stewart has died aged 97. Best known for her romantic suspense novels, the first, published in 1954, titled, Madama will you talk? became a best seller. Nineteen other novels followed, the last titled, Rose Cottage being published in 1997. She also published three children’s novels and a collection of poetry. Mainly writing romantic suspense novels, she did venture into fantasy, with the Merlin Trilogy, that began with The Crystal Cave, published in 1970, and ended with the fifth novel titled, The Prince and the Pilgrim, published in 1995. Ten novels have been selected from the 152 nominations for the 2014 IMPAC Dublin Award. One of the literary world’s largest annual awards, the nominations are made by 150 libraries from 39 countries. The winner will be announced on the 12th June 2014. From the short list we highly recommend the Dutch writer Gerbrand Bakker’s novel, The Detour, also published with the title, Ten White Geese, he previously won this award in 2010 for his novel, The Twin, and Irish writer Donal Ryan’s The Spinning Heart. As a great fan of Colombian author, and recipient of the Nobel Prize in Literature, Gabriel Garcia Marquez, I was very sad to hear of his death earlier this month, aged 87. Garcia Marquez died of pneumonia on April 17 2014 in Mexico City, where he had lived for over thirty years. Garcia Marquez was best known for his novels One Hundred Years of Solitude (1967) and Love in the Time of Cholera (1985), although he wrote a total of six novels, four novellas, five collections of short stories and seven non-fiction works. He was awarded the Nobel Prize in Literature on 8 December 1982, “for his novels and short stories, in which the fantastic and the realistic are combined in a richly composed world of imagination, reflecting a continent’s life and conflicts”. 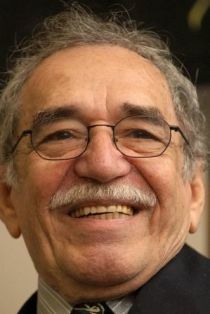 Garcia Marquez was the first Colombian and only the fourth Latin American to win the award. Garcia Marquez is recognised by many as being one of the literary greats. When first hearing of his hospitalisation, Colombian president Juan Manuel Santos said his country was thinking of the author and said in a tweet “All of Colombia wishes a speedy recovery to the greatest of all time: Gabriel García Márquez”. Carlos Fuentes recognises him as “the most popular and perhaps the best writer in Spanish since Cervantes”. “Memories of My Melancholy Whores is a powerful novel about a man who, so far, has never felt love. ‘The year I turned ninety, I wanted to give myself the gift of a night of wild love with an adolescent virgin’. Clandestine in Chile : the adventures of Miguel Littin / Gabriel Garcia Marquez ; translated by Asa Zatz. Love in the time of cholera [videorecording] / a Stone Village Pictures production in association with Grosvenor Park Media ; a film by Mike Newell. Sue Townsend, the creator of most popular character Adrian Mole, has died aged 68 after many years of ill health. Her writing was a mix of social commentary and comedy, with her first ‘Adrian Mole’ novel, The Secret Diary of Adrian Mole, Aged 13 ¾ published in 1982, becoming an instant bestseller. Eight more Adrian Mole novels were to follow, developing the character into adulthood and eventually middle age, ending with Adrian Mole: The Prostrate Years, published in 2009. Through her writing career, she produced 6 other novels, 11 plays, and two books of non-fiction. Her last novel titled The Woman Who Went to Bed for a Year was published in 2012. Wellington based author Philip Mann, has been shortlist for the 2014 Arthur C. Clarke Award for best science fiction book of the year with his novel, The Disestablishment of Paradise: a novel in five parts plus documents. From 121 nominations the judges’ selection of the final six did not include the new novels by Terry Pratchett, Margaret Attwood, or Kim Stanley Robinson, but included were three debut novelists. Philip Mann has lived in New Zealand since 1969, retiring from the position of Professor of Drama at Victoria University in 1998. He is best known for his science fiction series, The Story of the Gardener, The Master of Paxwax published in 1986 and The Fall of the Families published in 1987. The Disestablishment of Paradise is his first novel to be published since the four books in the series A Land Fit for Heroes, published from 1993 to 1996. The winner of the Arthur C Clarke Award will be announced on 1st May 2014 in London. The American writer George Saunders has become the first winner of the newest literary prize, the £40,000 British Folio Prize with his collection of short stories titled The Tenth of December. The Folio Prize was founded by the managing director of literary agents, Aitken Alexander Associates, and is to reward literary achievement regardless of form, genre or the writer’s country of origin. The final shortlist comprised of novels by Rachel Kushner (USA), The Flamethrowers, Kent Haruf (USA), Benediction, Eimear McBride (UK), A Girl is a Half Formed Thing, and Sergio de la Pava, (USA), A Naked Singularity. Anne Carson (USA) also made the shortlist for her volume of poetry, titled Red Doc. The shortlists for the 2013 Costa Book Awards have recently been announced from a record of 617 titles submitted. The categories include the Novel award, First novel award, Biography award, Poetry award, and Children’s book award, with each having a panel of three judges. The four novels in the all female shortlist of the this award are the much acclaimed, Life after Life by Kate Atkinson, Unexpected Lessons in Love by Bernardine Bishop, who died in July of cancer, Instructions for a Heat Wave by Maggie O’Farrell, and All the Birds, Singing, the second novel from the young Australian born writer Evie Wyld. Included in the first novel award is the much praised humorist novel, Marriage Material by Sathnam Sanghera. The winner of each category will receive £5,000 and the overall winner will receive £30,000, at the wards ceremony in London on 28th January 2014.